Now I’m not disputing the fact that my Mummy Bird does a cracking Sunday roast, but when she announced that she was taking us out and treating us all I couldn’t help but get a smidge excited. Daddy Bird had got other plans for that day, which was what had prompted the idea, but Chickadee decided to come out to make it a nice group of four. The only thing left to decide was where to go. 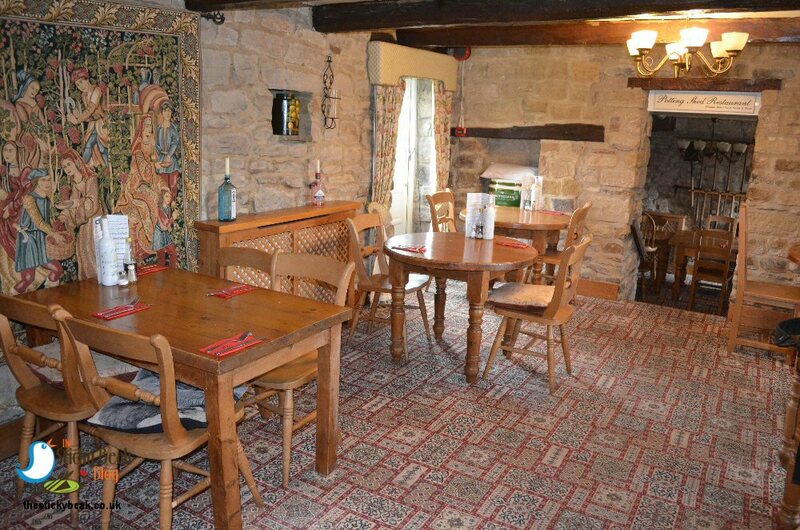 Separately, we’ve all been to The Plough Inn at Brackenfield before (and enjoyed our respective meals), but none of us had been on a Sunday so that was where we decided to go for our roast. The ample car park was fairly full when we pulled in about 12.45pm and we wandered into the main bar area to check-in and have a cheeky pre-lunch G&T. 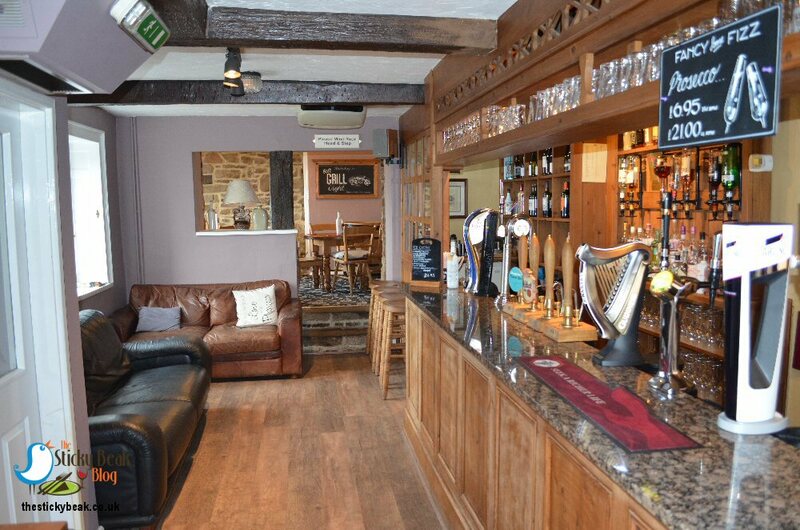 All the team at The Plough are lovely, I don’t think Steve (the owner) would entertain his staff being anything other friendly and welcoming, and we had a really sweet young lass who is a newcomer to team Plough. She was a bit nervous at first, but soon settled and started to have a chat with us and tell us all we needed to know; you can have just the roast (or other main course choice) for £11.95, have two courses for £15.95 or go the whole hog and have three courses for £19.95 – prices are per person. All four of us opted to have starters; I had the creamy Garlic and Thyme Mushrooms on toasted Ciabatta, Mummy Bird and His Nibs had the Deep fried Brie wedge with Cranberry purée and Watercress, and Chickadee fancied the Salmon Fishcake with dressed Pak Choi (not pork choi as was printed on the menu, thanks to an eagle-eyed reader who spotted this on our FB page!) and Sweet Chilli sauce. 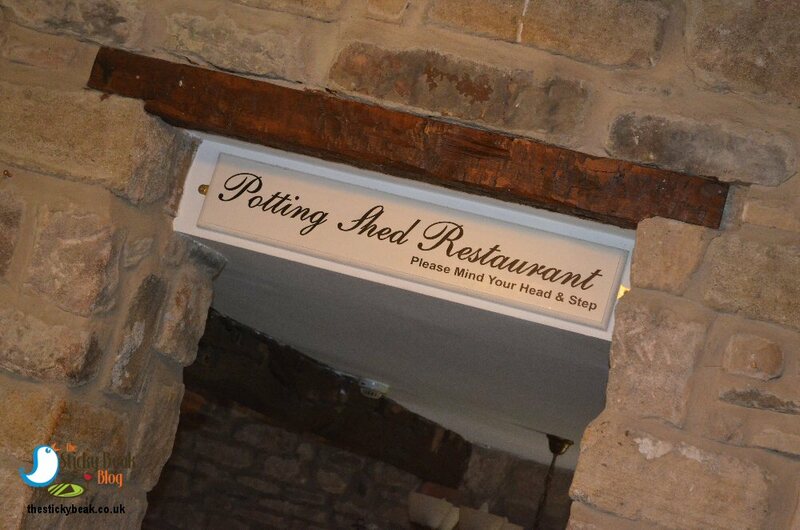 As well as the adult menu, kids have their own section on the menu, with items priced at £4.95. We also ordered a bottle of Pinot Grigio, very reasonably priced at under £18 and jolly nice it was too. 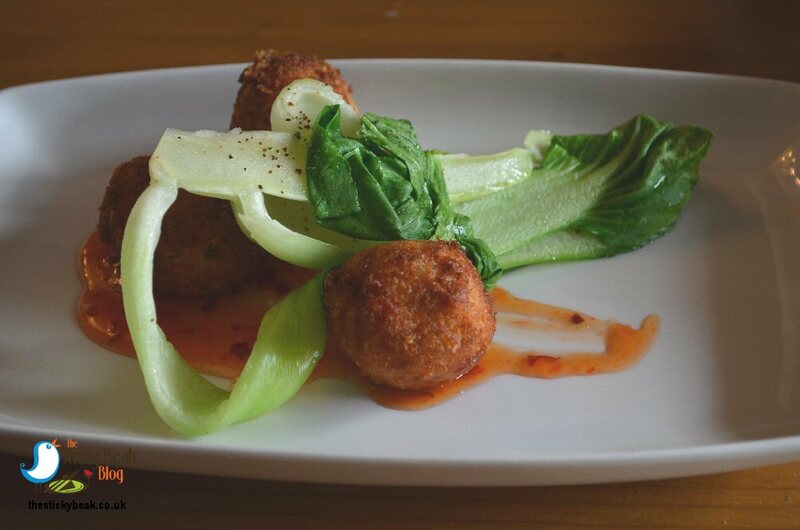 It wasn’t long before our first courses were being gently placed before us and they all looked lovely. My Mushrooms were nice and chunkily sliced, retaining their texture and gentle earthy taste. 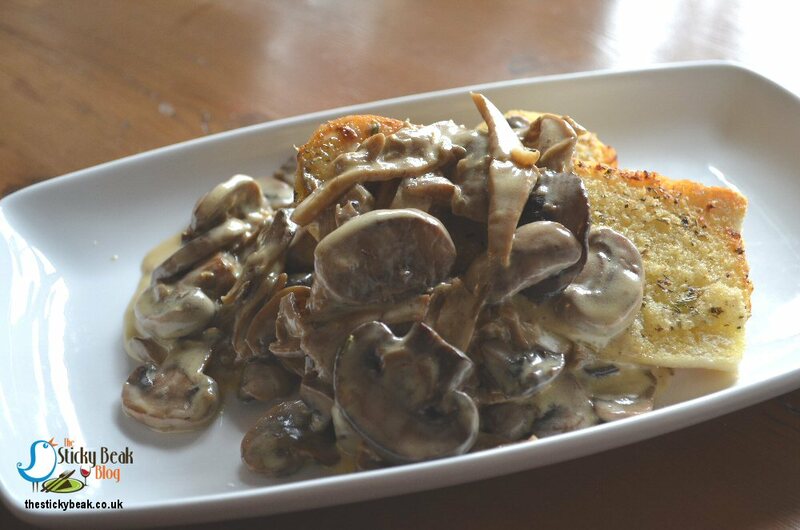 I really loved the creamy Garlic and Thyme infused sauce; this managed to be wonderfully rich yet light on the tummy, and it was thick enough to be easily scooped up with the mushrooms and bread. There’s nothing worse than a thin, dribbly sauce I reckon, so I was a very happy lady. Both Mummy and The Boy Wonder rated their Brie starter. They got a fab thick wedge of mild, silky Brie that was all melty in its middle and the light crisp batter that surrounded it was gorgeously crunchy when bitten into. Zingy, sharp Cranberry always makes a great partner to cheese and the peppery notes of the Watercress helped lift things on the palate. This was a classic starter, and it was done very well by Chef at The Plough Inn. Chickadee was tucking into her Salmon fishcake quite merrily, although she thought it was a bit too herby for her personal liking. I tried it, and it tasted tickety-boo to me and my ancient (her words, cheeky minx!) taste buds! Herb-gate aside, she was impressed with the texture and taste of the crispy coated fishcakes, saying how filling they were too. The Pak Choi had been sliced in half and cooked until just softened slightly, so you got all of its flavour and plenty of its natural texture left to enjoy. A gentle zip came from the Sweet Chilli sauce and provided a little bounce in the mouth from this great starter offering. A quartet of clean plates made their way back to the kitchen in the arms of our lovely young server, and we settled back to have a natter and sip our chilled wine. By now the time was just after 1.30pm and more folks were arriving including a couple of groups with their doggies and a young couple with their baby daughter that came to sit on the table next to us. A high chair was duly brought out for this beautiful little person and she proceeded to charm the rest of us in “her” space. So that’ll be a tick in both the “family friendly” and “dog friendly” boxes for Steve and his team at The Plough Inn at Brackenfield then. The meats to choose from for the Sunday Roast were Beef, Lamb or Pork and Mummy Bird and I had the Lamb, Chick had her favourite, Pork, and The Man went for the Beef. 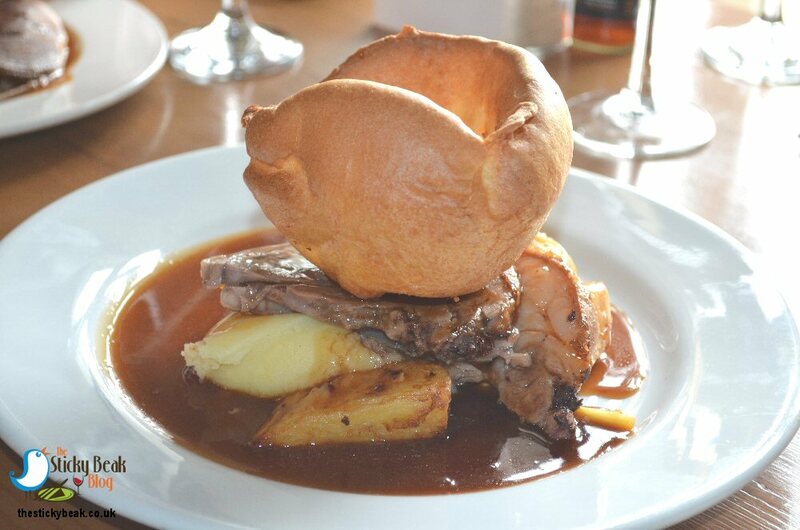 All of the Sunday Roasts come with creamed Mash, Garlic and Rosemary Roasties, stuffing, Homemade Yorkies, buttered vegetables, and proper meat gravy. We also had roast Parsnips nestled under the meat too; now Parsnips are one of my fave veggies so I was more than happy to receive His Nibs’ portion on my plate (he doesn’t like them, fussy hound that he is). A lot of folks won’t have Lamb as they think it’s too fatty, and there’s no denying that it does have more fat on it generally than other meats; however, the upside of this is that it imparts a great flavour to the meat. Mine and Mummy Birds thick slices had their fat in a layer on the outside, so it was easy to cut off, and the flavour was wonderfully deep. The fat had melted during cooking and gave the meat a gorgeous moistness and a hint of its taste that made our lips smack with happiness. The Man Bird and Chickadee were equally happy with their meat choices; both were generous in portion and were lovely and tender, and not dry at all. His Nibs had got some pungent Horseradish to go with his Beef, and it warmed his throat nicely when he swallowed it. I shared a pot of Mint sauce with Mummy Bird and it was thick enough to spoon out onto our plates without it dripping everywhere. Whilst I was at it I swirled some more of the deep green sauce into my meaty gravy and mixed some into the glass-smooth mash too; I love Mint sauce, and I really love Mint sauce mixed with vinegar and Mushy Peas! Seriously, if you haven’t tried this combo before, you really need to; you can thank me later!. 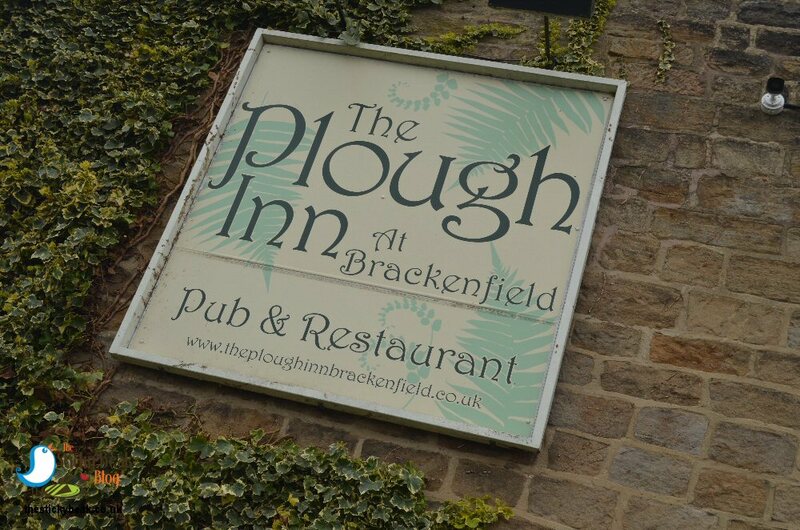 Anyhow, back to the topic at hand, the Sunday Roast at The Plough Inn at Brackenfield. We’ve established that the meats, mash, and gravy were up-to-standard, so let’s move on to the other bits of the meal. Nothing beats a crispy roast Potato, and the ones here were beautifully enhanced with the delicate flavour of garlic and Rosemary; my parsnip was also pretty good, retaining some of their texture when bitten into. The sage and onion stuffing was bang on too with its punchy herby flavour and crisp-outside-soft-inside texture. 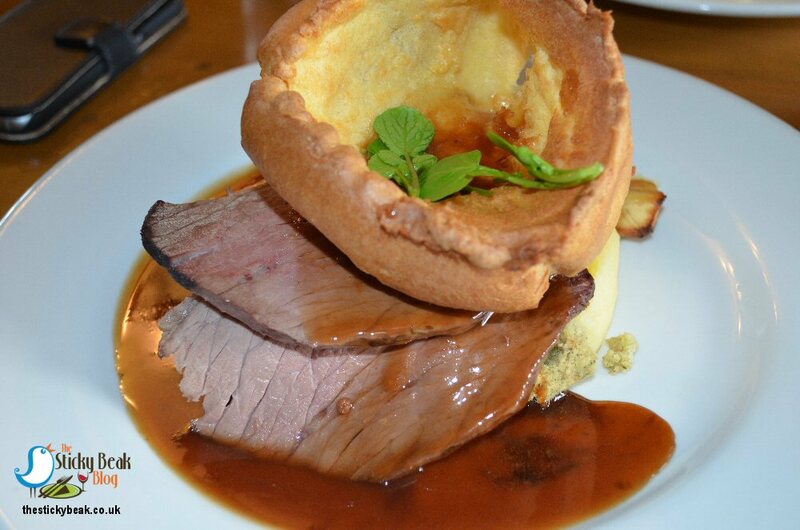 Another cornerstone of any respectable Sunday roast is the Yorkshire pudding. These can come as small individual ones as well as larger multi-portion sizes, but whatever their proportions they’ve got to be skyscraper tall, crispy outside with a soft (but not soggy!) bottom. Come to The Plough Inn at Brackenfield and you’ll not be disappointed with their Yorkies; these beauts were massive, and ticked all the boxes. 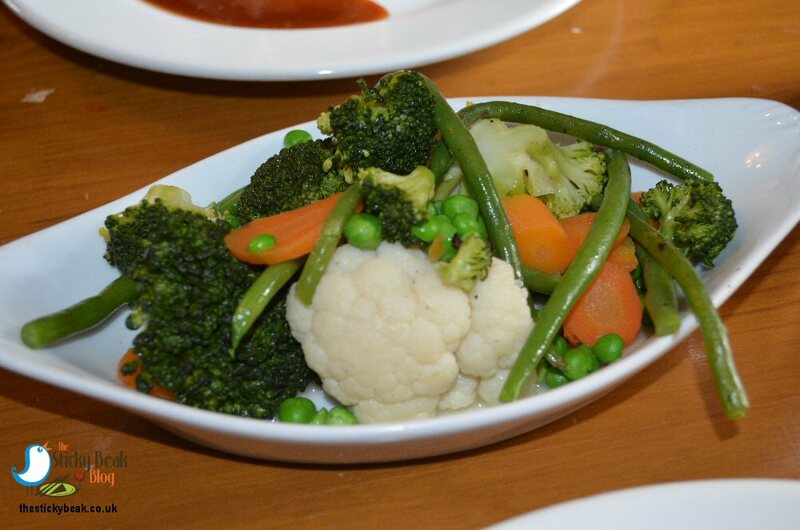 Buttered vegetables came in a couple of separate dishes, and there was a nice selection: Broccoli and Cauliflower florets, whole trimmed Green Beans, and Carrot slices. All of these were nicely firm to the bite and were glistening with melted butter; you can ask for unbuttered vegetables if you prefer, just mention it to your server. 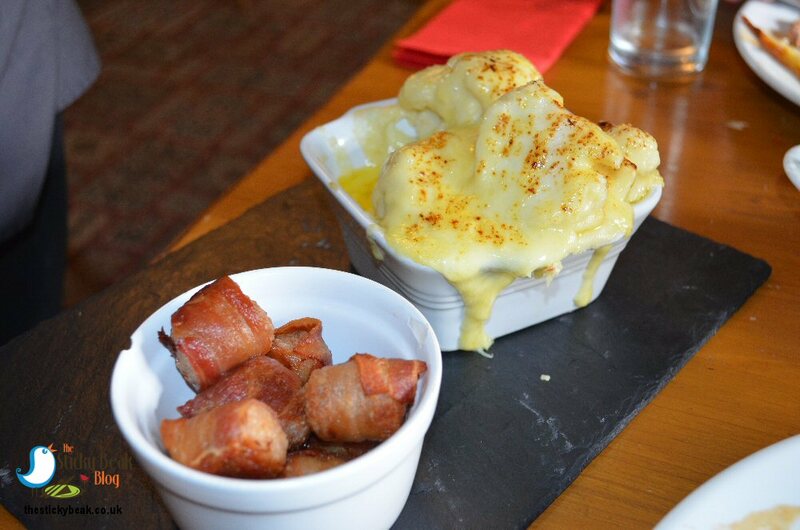 We’d also ordered a couple of sides, which are all priced at £2: Cauliflower Cheese and Pigs in Blankets. To be fair, given the size of the portions at The Plough Inn, we didn’t need the extra sides; that’s the thing though, when you go somewhere new, you’re never sure whether you’ll need a bit more. Although there’d been a mix-up and our sides got delayed a bit, we still scoffed them! This is where our hearty appetites come in useful. Mummy Bird felt that the Cauliflower in the Cauliflower Cheese was a little too firm for her; the florets are larger in size and were a bit firmer to the bite, but I like it this way, so I was perfectly happy with them. No-one murmured about the cheese sauce though – it was fab! We all loved its gooey meltiness and the Cheddar used had a great punch to it, so you got a brilliant hit of the cheese against the vegetable. His Nibs was reluctant to share the bacon-wrapped sausage morsels, but he had no chance against Chickadee – she was in the dish quicker than Usain Bolt in his hey-day! I tried one of the mini marvels and they were delicious, I must say. I’m a bit funny when it comes to sausage, as you all know, but the ones used here were really nice butchers’ quality ones; most important of all, they didn’t have any “repeat factor” to them. The bacon was just nicely crisped so you got a lovely textural sensation when you bit into the blanket, as well as the pig. There was only a bit of the Cauliflower cheeses’ sauce left out of the entire meal, oh and the fat that we’d cut away from the meat. Other than that, four clean plates were being whisked away to the kitchen again. None of us could face a pudding though, and had to admit defeat. Well, we probably could’ve gobbled one down, but we’d have made ourselves bloated and uncomfortable. Why spoil a perfectly good meal by being over-ambitious? The total bill for the four of us having 2 courses, 2 extra side dishes, a bottle of wine, a pint of Peroni, 2 Gin and Tonics, and a coffee came to just under £100, which we all thought was perfectly reasonable. Given the quality and quantity of the food, I think this represents fab value for money so I’m quite happy to award Hot Wings to Mr Brough and his team at The Plough Inn at Brackenfield. His new Chef has passed muster.